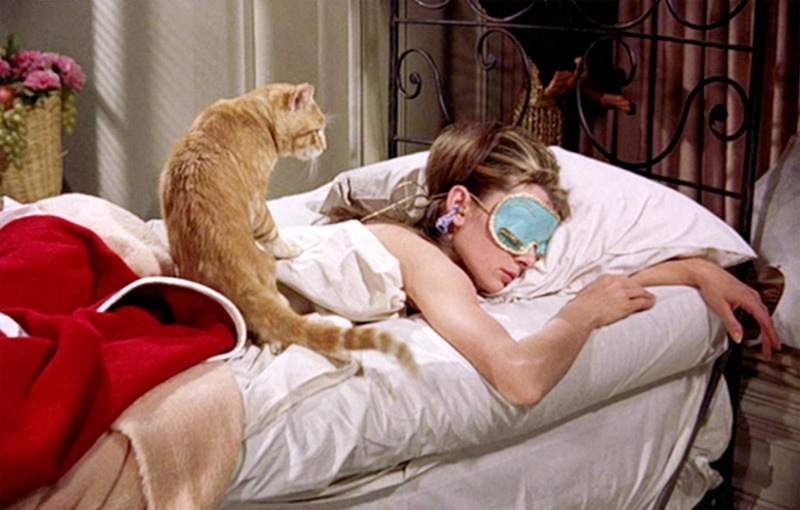 "Breakfast at Tiffany's" ranks as one history's most iconic films. Audrey Hepburn as Holly Golightly has a style and elegance that is simply timeless. Her exquisite wardrobe was designed by Hubert de Givenchy, whose Greek key logo is referenced in the rug and pillows in this inspiration board. The room has touches of Tiffany Blue. The luxurious limited edition Jennifer Delonge Glider and the pale Tiffany blue walls are offset by black, white and silver accents that evoke Ms. Golightly's beautiful wardrobe. "Cat" has a starring role in this nursery in the playful mobile. Scene from "Breakfast at Tiffany's"
The reproduction Hollywood Regency Dresser (which also serves as a baby station), is reminiscent of 60's Hollywood glamour. There's a certain frivolity to the room design that I think was a characteristic theme of the film. The original Oliver Goldsmith "Manhattan" sunglasses, worn by Audrey Hepburn in the film, are actually produced in a children's version. I thought the Tiffany silver spoon added a little touch of whimsy. Obviously, I've only referenced the film on a superficial level but I do feel that if Ms. Golightly ever found a home "that fit," it might look something like this.